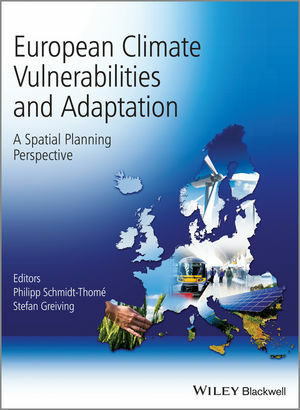 European Climate Vulnerabilities and Adaptation: A Spatial Planning Perspective analyses the impacts climate change might have on regions and their local economies. Regions clearly differ in view of the complex patterns of climate change impact, but also regarding the given vulnerability and coping capacity. Impacts of climate change can have a marked effect on the functioning of regions and sectors of the society, if not properly addressed. Readiness to adapt to the impacts and lasting changes counts towards vulnerability of the regions. The book builds upon the findings of a project conducted under the European observation network for territorial development and cohesion (ESPON), The ESPON Climate project. Following the stipulations of the ESPON programme and the tender for this project the territorial focus is the raison d’être and methodological core of the project as a whole and its various research actions: The outcomes of each action will be focused on what impacts global climate change will have for the different European regions and how the regions can cope with the projected impacts in order to become less vulnerable to climate change. Philipp Schmidt-Thomé, Senior Scientist, Geological Survey of Finland, Finland. Stefan Greiving, Professor, University of Dortmund, Institute of Spatial Planning, Germany.